“I do not understand why this matter (the Ayodhya controversy) is being regarded as trivial by Your Lordships...if Your Lordships deem polygamy as an issue more serious than this matter, then Your Lordships may tell us”, he continued. Senior Counsel Raju Ramachandran supported his prayer in this behalf. On March 26, another three judge bench headed by Chief Justice Misra had referred to a larger bench the petitions challenging the constitutionality of the practices of nikah-halala and polygamy. “Why should I waste the time of this court in repeating the same arguments before a larger bench?”, inquired Dr. Dhawan. “That is not a concern...you can take all the time that is needed”, assured Justice Bhushan. “We thought it appropriate to appreciate the (Ismail Farooqui) judgment from your point of view”, remarked the Chief Justice. Thereupon, Dr. Dhawan resumed his submissions in the light of the 1994 Supreme Court judgment in Ismail Farooqui. He Indicated the portions of the judgment dealing with the Statement of Objects and Reasons of the Acquisition of Certain Area at Ayodhya Act of 1993, which elaborates that in view of the long standing Ram Janmabhoomi-Babri Masjid dispute which peaked with the destruction of the Mosque in December, 1992 followed by communal violence resulting in deaths, injuries and loss of property, it was deemed appropriate in the interest of public order and harmony to acquire the disputed structure to develop the same as a complex comprising of a Ram temple, a mosque, a library and a museum. “Nowhere in the Act or even in the operative part of the judgment has it been stated that Muslims, in the practice of their faith, may pray anywhere or that the Mosque is not an essential part of the religion”, remarked Dr. Dhawan. 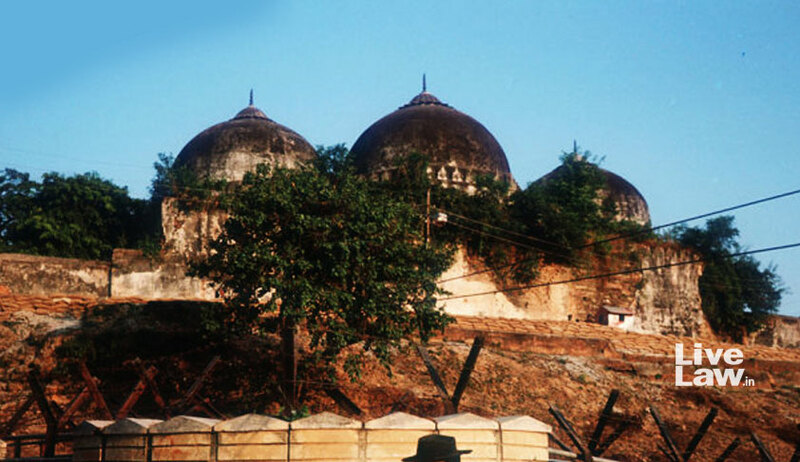 “The judgment need only have shown why section 4(3) of the Act of 1993 (providing for the abatement of any suit, appeal or proceeding in respect of the area comprising of the disputed structure of Ram Janmabhoomi-Babri Masjid which vests in the Central government by virtue of the Act) was struck down”, he added. In context of section 7(2) stipulating that the Central Government or the authorised person shall ensure that the position existing before the commencement of Act in the area on which the structure (including the premises of the inner and outer courtyards of such structure), commonly known as the ‘Ram Janma Bhumi - Babri Masjid’ is maintained, he advanced, “No extra meaning was required to be supplied to explain the maintenance of status quo”. “When I first read the (Ismail Farooqui) judgement, it seemed to be influenced by the atmosphere prevailing then...this judgment is not a good interpretation of section 7(2) of the Act...why, in the context of status quo as envisaged by a neutral section 7(2), was ‘comparative use’ mentioned in the light of the controversy on the use of the disputed structure as a mosque between 1934 and 1949?”, he continued. Therefrom, he proceeded to section 13(2)(b) which provides that any suit, appeal or other proceeding in respect of the right, title and interest relating to plot No. 242 in village Kot Ramchandra in Ayodhya pending before any court, tribunal or other authority, shall be deemed never to have abated. “This statement of the Solicitor General is consistent with the purpose of the Act of 1993”, commented Dr. Dhawan. Continuing, he relied on the paragraphs of the Ismail Farooqui judgment dealing with the meanings of the term ‘vesting’ as used in sections 3, 4, 6 and 7, in the light of the decision in Maharaj Singh v. State of UP. “Meaning of the term ‘vesting’ in section 6 is transitional from sections 3 and 4...Like Justice Jeevan Reddy had observed in [Printers (Mysore) Ltd v. Asst. Commercial Tax Officer (1994)] that if the context does not permit or where the context requires otherwise, the meaning assigned to a term in the definition in the statute need not be applied...”, remarked Dr. Dhawan. Indicating the quote in the 1994 judgment from a speech of President Shankar Dayal Sharma that “the initial appearance of Christianity or Islam or Zoroastrianism in India and their establishment on the mainland did not occur as a result of military conquest or threat of conquest. These religions were given a place by virtue of the attitude of accommodation and co-existence displayed by local authorities - including the main religious authorities”, he commented, “there was no occasion for the court to go into the ‘comparative significance’ of places of worship”. “With regard to Varanasi and a mosque next to it, will the ‘comparative significance’ be evaluated? This is a history lesson about the future of Indian secularism”, he added. Continuing reading from the Ismail Farooqui judgment, he refuted the observation that “The interest claimed by the Muslims is only over the disputed site where the mosque stood before its demolition”. He also questioned how certain buildings on the disputed site came to be regarded as ‘Manas Bhawan’ and ‘Sita ki Rasoi’ and hence, deemed as belonging to the Hindu community. In so far as the 1994 judgment notes that “...at a later stage when the exact area acquired which is needed, for achieving the professed purpose of acquisition, can be determined, it would not merely be permissible but also desirable that the superfluous excess area is released from acquisition and reverted to its earlier owner”, Dr. Dhawan questioned the maintainability of the allocation of one third shares each of the area to the Nirmohi Akhara, Ram Lalla and the Sunni Waqf Board. In so far as the judgement states that “...there can be no reason to hold that a mosque has a unique or special status, higher than that of the places of worship of other religions in secular India to make it immune from acquisition...”, Dr. Dhawan remarked, “so far, so good”. But he reiterated his argument from the previous hearing to the observation in the judgment to the effect that “A mosque is not an essential part of the practice of the religion of Islam and Namaz. (prayer) by Muslims can be offered anywhere, even in open”. Concluding his submissions for the day, he once again drew the attention of the bench to the judgment of Justice B. K. Mukherjee in The Commissioner, Hindu Religious Endowments, Madras v. Lakshmindra (1954) wherein it was observed that what constitutes the essential part of a religion is primarily to be ascertained with reference to the doctrines of that religion itself. The hearing shall resume on April 27.